hand painted on the inside. luminescent glaze wash on it, too. and more difficult to find these days. I love footed teacups too,Michel and yours is really pretty! It's beautiful, Michele! I like how it is raised up enough that you can see the pretty design on the saucer. A footed teacup takes the elegance of tea to a higher level, doesn't it? You have some pretty ones. You have a real treasure. I don't have a footed teacup and I keep looking! I don't have one either and I keep looking, too. Is it Bavarian? Whatever it is, it is a beautiful piece. Your tea must taste especially nice when served from that tea cup. Kinda quiet in Blogdom this morning... I may be able to get something done! A very pretty one indeed! I love them too! What a beauty that teacup is, Michele! 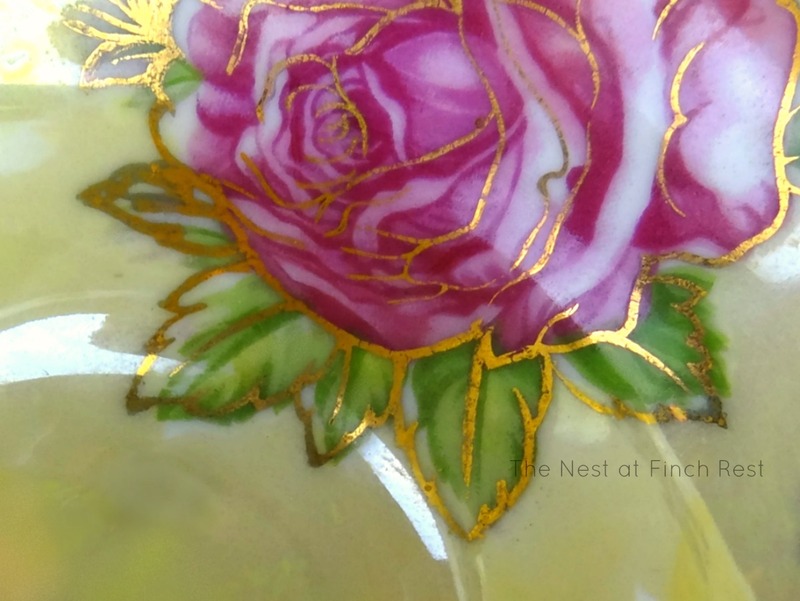 You have some very pretty footed tea cups. I have a few that I inherited from different family members. How regal! That's a beauty! Don't think I've ever seen a footed teacup except in an old movie. Yours is absolutely exquisite. So gorgeous I'm envious. I'm not really a teacup lover but I'd love to have yours just because it's so beautiful, to look at such a pretty thing to have. I even have a little stand for a cup and saucer. Happy for you to find such a special thing. Enjoy. Hi Michele, I just realize, I don't have a footed teacup! Now I will be looking for one to go with my collection. I love the colors and the pattern on this one, just lovely. Thanks for sharing. What a treasure - BEAUTIFUL!!! That is so pretty Michele. I have never seen a footed-tea cup until now. It is very delicate and feminine. You must have an amazing collection of tea cups. Have a nice week and I hope you're mending well. Pretty footed teacup Michele. I've been lucky to find a few myself. Thank you for sharing and have a great week. 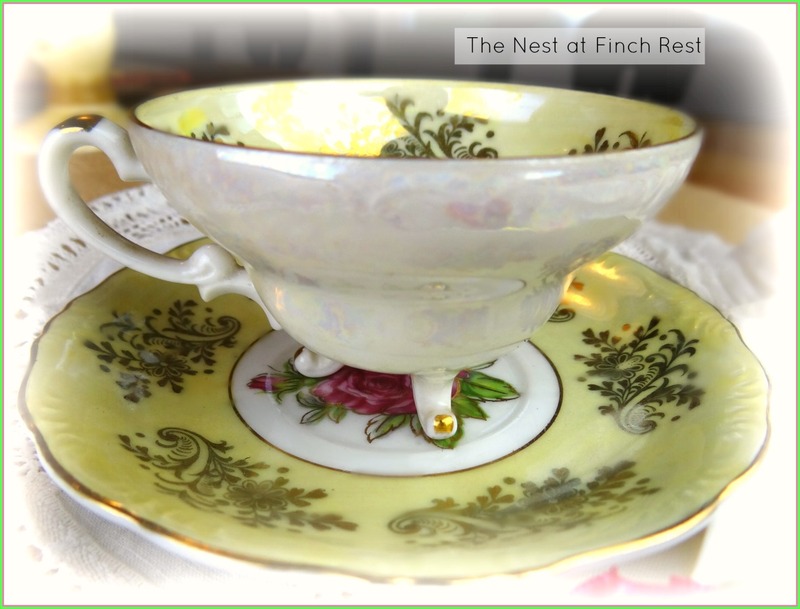 I love footed teacups and would love to add one to my collection. I am going to start a search for one. This is just beautiful. 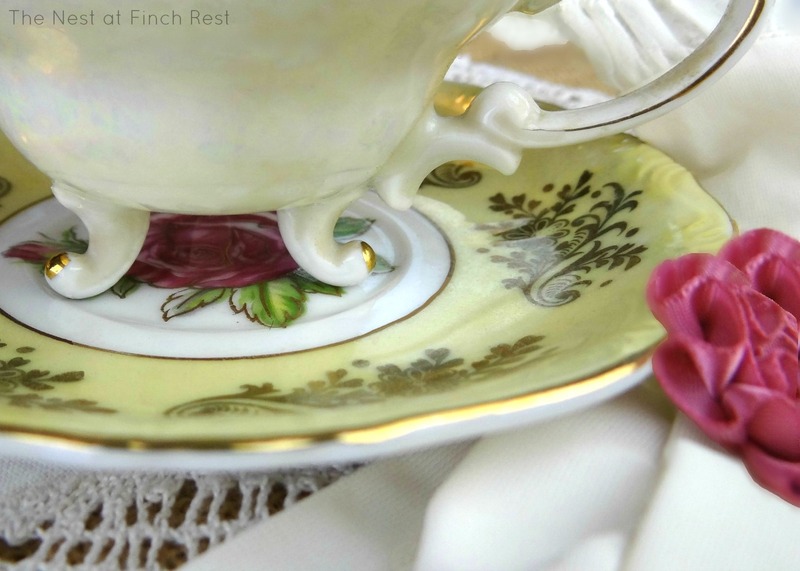 So pretty and I can just imagine them at every tea gathering in a Victorian parlor..
Michele, you have the prettiest collection of tea cups I have ever seen! Each one is more lovely than the next! Pretty teacups. I used to collect teacups and saucers, but I never had a footed cup. So delicate and gorgeous!! Thanks so much for stopping by, Michele, and for your lovely comments. I love all your wire baskets too! What a pretty selection. The feet and the luminescence are amazing. I'm always on the lookout for a footed teacup. I think they are the sweetest! Thanks for sharing this one. It's adorable. Oh wow, how fun it would be to find THAT waiting at the bottom of my cup of tea! Oh Michelle that is such a pretty tea cup ! I love unusual shaped cups with feet or fluted edges. It's a shame that more modern day designs aren't like this.